I had a difficult conversation with someone this morning. Not difficult as in confrontational; Difficult as in emotionally raw. Vulnerable. Tender…Difficult. This person was needing and asking me to extend a measure of grace and without hesitation, although perhaps (and then again, maybe not) against all reason, or odds or…I don’t quite know…history? I freely gave it. I didn’t have to think twice. They did not specifically ask for grace– but that was the tone of our conversation. And I did not specifically say, “Here is grace. Please have it.” That is not usually how grace is exchanged. But there is a moment when one person has a need or weakness and another person simultaneously has the terrifying power to so easily and unnecessarily hurt or cause suffering…and chooses not to. And it is so soothing and tenuous and frightening. And I am not acting as a self-proclaimed Grace-Giver here– spouting off about it would be the antithesis to graceful. I almost feel as though I am observing it objectively– because let’s be honest and clear– I do not always give grace. And I do not always give grace freely. In our base humanity, there are times each one of us gives “grace” with many many spoken or unspoken conditions attached. And this is not grace at all. And so all day long I have ruminated about the nature of grace. About what it means. What it feels like to give grace and receive grace. About unmerited favor. Undeserving mercy. And it has kept the tears close to the surface. There is something achingly beautiful and fragile and fervent about the nature of grace that is undoing me today. And perhaps that is why this morning’s conversation is affecting the landscape of my heart so deeply today. Because life is hard. 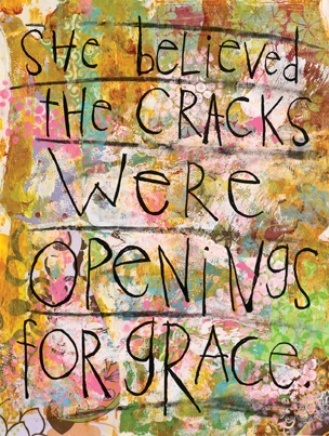 And grace makes hard things easier. What, exactly, do I mean by grace? “Grace is love that seeks you out when you have nothing to give in return. Grace is love coming at you that has nothing to do with you. Grace is being loved when you are unlovable…. The cliché definition of grace is “unconditional love.” It is a true cliché, for it is a good description of the thing. Let’s go a little further, though. Grace is a love that has nothing to do with you, the beloved. It has everything and only to do with the lover. Grace is irrational in the sense that it has nothing to do with weights and measures. It has nothing to do with my intrinsic qualities or so-called “gifts” (whatever they may be). It reflects a decision on the part of the giver, the one who loves, in relation to the receiver, the one who is loved, that negates any qualifications the receiver may personally hold…. Grace is one-way love.” – Paul Zahl, as quoted in William Tullian’s book, One -Way Love.